The VP-732 is a 10-input presentation switcher/dual scaler with four HDMI, two DisplayPort and four user-definable (universal) analog video inputs. It up- and down-scales to selectable graphics or HDTV output resolutions to preview and program outputs (up to 4K UHD on the program output) and provides ultra-fast fade-thru-black switching between sources. VP-732 supports analog and embedded audio inputs and outputs and includes rich audio functionality and a stereo loudspeaker output. K-IIT XL Picture-in-Picture Image Insertion Technology - Ultra-stable picture-in-picture, picture-and-picture, and split screen capability. Any input source can be inserted into or positioned next to any other source or vice versa with window positioning and sizing controls. 10 Program & 10 Preview/PIP Input Select Buttons - For quick selection of the program/preview/PIP source. Audio Inputs - 10 3.5mm. Output Resolutions - With selectable refresh rates: up to 4K UHD on the program output, 720p on the preview output. 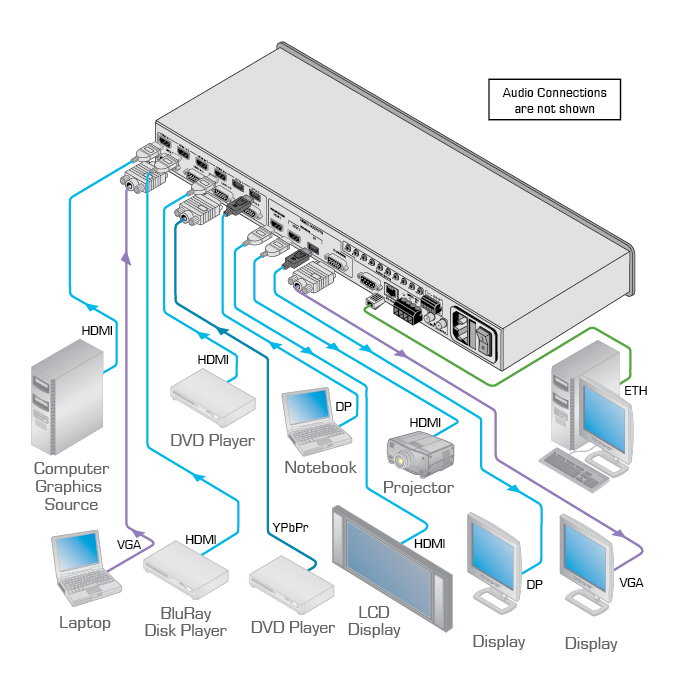 Scaled Video Outputs - On 2 HDMI, 1 DP and 1 15-pin HD computer graphics connectors. Audio Breakaway and Audio-Follow-Video Support. Embed/De-embed Audio - On the HDMI and DisplayPort inputs and outputs. Function Buttons - BLANK and FREEZE buttons for both preview/PIP and program outputs. Powerful Audio Features - With DSP technology including audio equalization, mixing, delay and so on. Built-in Web Server - Built-in Web pages for full control via Ethernet.